Doris Roberts was best known for her role as Raymond Barone’s mother, Marie Barone, on the CBS sitcom, Everybody Loves Raymond. The 90-year-old Missouri native’s career spanned 65 years, and she appeared in the films Barefoot in the Park, Divorce American Style, The Honeymoon Killers, The Heartbreak Kid, Rabbit Test, National Lampoon’s Christmas Vacation, Aliens in the Attic, Madea’s Witness Protection and Old Soldiers, just to name a few. Television appearances included Studio One in Hollywood, Ben Casey, The Mary Tyler Moore Show, All in the Family, Rhoda, Barney Miller, Angie (Theresa Falco), Fantasy Island, St. Elsewhere, Cagney & Lacey, The King of Queens, Touched by an Angel, The Middle, Grey’s Anatomy and Melissa & Joey. Roberts passed away on April 17, 2016, at the age of 90. Melissa Parker (Smashing Interviews Magazine): How are you today, Doris? Doris Roberts: Pretty good. Let’s go with it. Melissa Parker (Smashing Interviews Magazine): Great. What are your recent projects? Doris Roberts: I did a movie called No Deposit, and it’s not a comedy. Another film I did is called The Red Maple Leaf, and that’s also not a comedy. It has Eric Roberts, James Caan and Paul Sorvino. Melissa Parker (Smashing Interviews Magazine): You’ve had such a long, storied career. What started it? Doris Roberts: When I was in kindergarten, I had a line in a little play, and the line was, “I am Patrick Potato, and this is my cousin, Mrs. Tomato.” I heard laughter, and that’s when the acting bug bit me. Melissa Parker (Smashing Interviews Magazine): After such a successful career in theatre, what inspired you to get into television and films? Doris Roberts: After seeing me in the play, Bad Habits, Lily Tomlin brought me to California because she wanted me to do her television show. We won all the Emmys that year. That’s what brought me to California, and I’ve been working ever since. That’s why I’m here. Melissa Parker (Smashing Interviews Magazine): Studio One (1952) was a showcase for different dramas or teleplays, correct? Doris Roberts: Yes, it was. It was an hour show, and they were usually dramas. Melissa Parker (Smashing Interviews Magazine): Wasn’t there sort of a “stigma” in the 60s that being on TV wasn’t really acting as compared to doing films? Doris Roberts: (laughs) What I did was acting, and I’ve got a lot of medals for it. I have five television Emmys. I have a SAG award, so I was acting. I wasn’t doing anything other than acting. Melissa Parker (Smashing Interviews Magazine): You sort of found your niche in film and TV early with a kind of “mom-like” presence, but later also had roles playing strong women savvy of the ways of the world. Was that a conscious choice? Doris Roberts: No. I took the job I was offered. That’s what was conscious for me (laughs). Melissa Parker (Smashing Interviews Magazine): You just wanted to be an actor. Doris Roberts: I still do an acting class every Saturday morning. Melissa Parker (Smashing Interviews Magazine): Why do you think, as an actor, you are so relatable to the general public? Doris Roberts: Because I don’t act like a star, because I’m real, people know that when I act, I’m behaving properly, and I don’t have an ego that interferes with my being honest and real and involved. I love to act. Melissa Parker (Smashing Interviews Magazine): The first time you were on a regular on a TV show? Doris Roberts: It was a show called Angie, and I enjoyed working with all those people. It’s what I love to do. I’m good at it, and I have five Emmys to prove it. It was great. Garry Marshall has a great sense of humor. I had a great time. Melissa Parker (Smashing Interviews Magazine): In the 60s and 70s, was it difficult to get roles as a strong, assertive woman? Doris Roberts: No. I didn’t find it difficult at all. Melissa Parker (Smashing Interviews Magazine): Weren’t you the first choice for the character of Vivian (Rue McClanahan) on Maude? Doris Roberts: I’m not sure about that. If I was, no one ever told me that. Melissa Parker (Smashing Interviews Magazine): In 1996, the perfect storm happened with Everybody Loves Raymond and that fantastic cast! 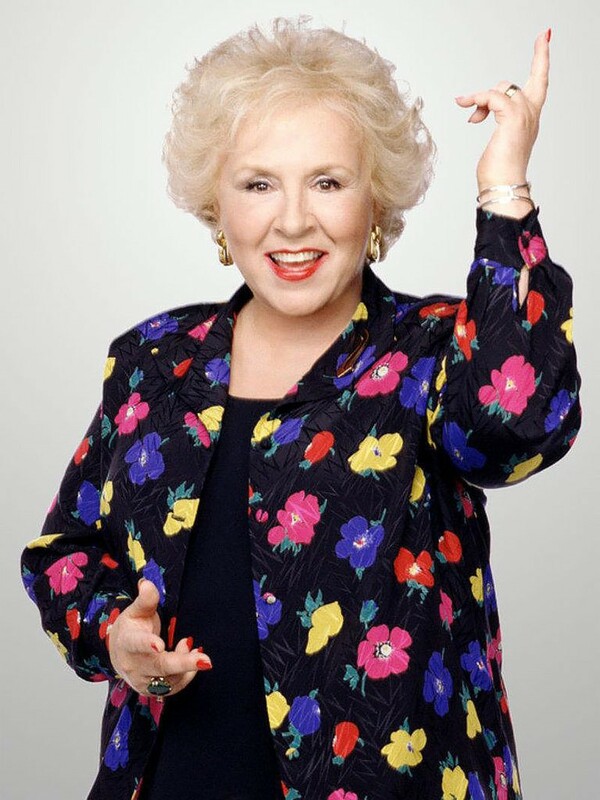 Doris Roberts: Nine years of that! We were on in 171 countries in the world. Melissa Parker (Smashing Interviews Magazine): Why is Everybody Loves Raymond still popular with fans today? Doris Roberts: I think it’s still popular because it’s based on reality. The relationships are based on reality. There were wonderful writers on the show and wonderful actors. I loved working with Peter Boyle. It was a joy to work with him. He died, you know. But we had a good time working together. Ray Romano is a great guy. He’s real and he’s honest. He has great integrity. He works real hard. He’s in New York now with his other show, so that’s exciting. Melissa Parker (Smashing Interviews Magazine): Will you appear again on The Middle as Mrs. Rinsky? Doris Roberts: I don’t think so because we had a special relationship on Everybody Loves Raymond. I did two of those shows, and I guess they thought that was enough. They didn’t want it to look like they were doing Everybody Loves Raymond instead of Patricia’s show, you know. Melissa Parker (Smashing Interviews Magazine): Was there ever a time in your career where the press printed or said something wrong about you, or something you didn’t like? Doris Roberts: (laughs) No, thank God! No, they haven’t. People stop me on the street all the time, and they start by saying, “I love you and I love your work.” What more can I ask for? I’ve also written my autobiography called Are You Hungry, Dear? Melissa Parker (Smashing Interviews Magazine): What’s your favorite role over your entire career? Doris Roberts: Oh, my goodness. It’s hard to choose because when I’m working in a role, I’m fully involved in what I’m doing. Then I go off into the next show, and I have to get myself all ready for that. This is a wonderful acting class at the Beverly Hills Playhouse. You can never stop learning. Keep working at it, and you’re going to get better. Melissa Parker (Smashing Interviews Magazine): Is your son, Michael, in show business? Doris Roberts: Not anymore, no. Melissa Parker (Smashing Interviews Magazine): Do you have grandchildren? Doris Roberts: I do. I have three wonderful grandchildren. Two of them have graduated college. One of them went to get a job out of college, and he got the first one he applied for. How about that? Melissa Parker (Smashing Interviews Magazine): What kind of a grandmother are you? Doris Roberts: A good grandma. I love them. I just love them. Melissa Parker (Smashing Interviews Magazine): Your favorite charities? Doris Roberts: I’ve had 18 years working for Children Affected by AIDS Foundation, and I’ve raised $80 million. Melissa Parker (Smashing Interviews Magazine): I know you’re a registered Democrat. What do you think about Donald Trump? Doris Roberts: I think he needs help, don’t you? Melissa Parker (Smashing Interviews Magazine): Is show business difficult for an older actor? Doris Roberts: Well, you’ve got to be pretty healthy to get around. You’ve got to remember lines and look good. It has its moments. You have to be lucky enough to be able to get around and have your brain clear so you can memorize. But that’s all part of life, isn’t it? I’m in good shape. I get out in the mornings on my bike, and I do three miles at least. How about that? I want to be healthy. Melissa Parker (Smashing Interviews Magazine): Doris, it was an honor and a pleasure chatting with you today. Doris Roberts: I had a good time. Thank you.